England has entered two teams in the event, which will consist of a singles, pairs, triples and fours for each team. Swift is a travelling reserve for her team, which also includes Ajay Morphett of Egerton Park IBC, Bexhill-on-Sea, Joseph Vandepeer of Oyster IBC, Kent, Matthew Bell of Scarborough IBC, Danielle Wild of Spalding IBC and Devon Cooper of Riverain IBC, Herts. 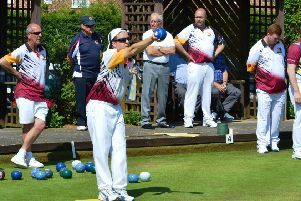 Swift has had success in the past few months, winning the NBYDS Pairs, the Women’s County Fours, and qualifying for the National Championships in the National Fours. THE following ladies have been selected to represent Northants Ladies in a friendly against Berkshire at at Woodley BC in Woodley on Friday (1.30pm). Travel is by coach picking up at Kettering Leisure Village at 10am and Billing Road in Northampton at 10.30am. NORTHANTS Men have started the new outdoor season in earnest, with manager Phil Reeve holding a Middleton Cup trial last Saturday at Kingsthorpe BC. In glorious sunny weather, he was able to see 40 players in action, all bidding for a place in his team. The trial was of five rinks versus five rinks, with each rink having a marker to judge the players’ performance, and in addition to many regular Middleton Cup players, on show were a number of emerging players, such as Simon Coles of Northampton Express and Dave Jones of Abington. Following the trial, the following players have been selected for a Middleton Cup practice match against Oxfordshire BA to be played this Saturday (May 12) at Oxford City & County BC in Oxford (2pm). Included in the squad is a player of proven ability from Cumbria, who has just moved to the county – Gavin Taylor, This match gives Reeve another opportunity to look at more players who did not play in the trial. THE following players have been selected to represent the Northants Men in a friendly against Oxfordshire next Tuesday (May 15) at Brackley BC in (2pm). 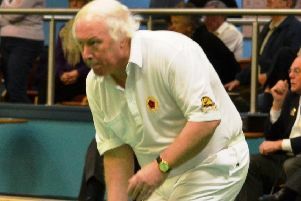 Inter-Club Two Fours: Preliminary round: Northampton Express BC A beat Abington BC A 40-19.